We recently bumped into some friends at the mall. They were buying Christmas gifts for their son’s classmates. They said that he would come home everyday from school with a new gift each day. So they felt “compelled” to reciprocate the gesture. 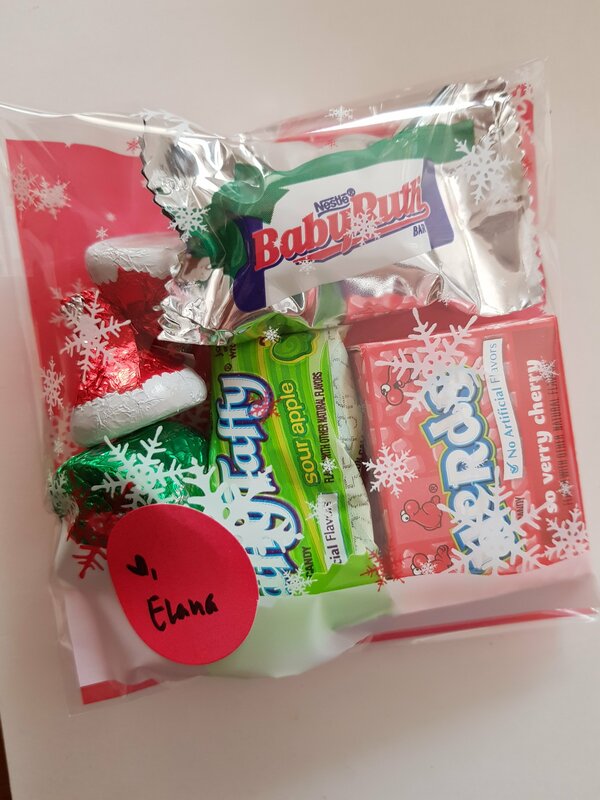 I had it in my mind that I got that covered… I mean come on… our kids get so many presents from family and friends… a small token from classmates would be enough… so I pack a few pieces of candy in a cute little pouch and slap a sticker on it… I’m done!!!! Then comments like, “she probably only has one kid!”… (though I do have a friend who lives abroad that has 3 kids and the time to be a total Pinterest mom! )… but kidding aside… I found myself wanting to be THAT mom… the mom who not necessarily has the time but makes the time to actually print out tags and pack an assortment of goodies. I have 3 kids… the youngest of which seems to be joined to my hip… he cries when I put him down… even just for me to pee… so when will I find time to actuallly do anything creative?! Then I realized that I should be happy for moms who are able to achieve such Pinterest worthy stuff. I don’t have to be like then… we all do what we can with what we have! As the Christmas season approaches, we begin to ponder about… where to put the new gifts our children will be receiving. Of course, we think about the reason for the season. Wherein the virtue of generosity and the importance of giving becomes the center of the celebration. Each year since our eldest had her first Christmas, our tree has been filled…filled with beautifully wrapped gifts. Now that we have 3 children, I can only imagine the amount of space their gifts will take up. (Please don’t get me wrong, I am in no way bragging about how much gifts they get… I am just grateful that we have such generous family and friends who have so much love for all our children). With this in mind, my husband and I try our best to purge and declutter our small home to prepare for the coming gift-filled holiday. As we purge through each room, year after year, we are faced with unopened boxes of toys, unused clothes, (sometimes) even still wrapped gifts. We are at a loss on what to do with them all. We mostly donate, share, to those who we think would need them or put them to good use. We try to teach the children the importance of sharing and living simple. How decluttering our surrounding acutally declutters our lives and our minds to make things simpler. However, after this year, comes another, and another. Going through the receiving, keeping, sorting, giving, every year will be tiresome… and, I’m sure at time, wasteful. So what can we do to get the most from this season? In the recent years, we have realized that family and friends will give gifts, whether it be for birthdays or Christmas, even if you, in the best way possible, let them know that there is no need to send or give gifts. Our eldest is 9, and we have kept the best toys in good condition that her siblings are able to enjoy them until now. So, if each child would get the same amount of gifts our eldest would, we may not have space in their room. So what can we do about all this? Do we send out a message via email or sms or even a post on social media to tell everyone not to send our kids gifts? It’s not about telling them not to give our kids gifts because we still want our children to enjoy the season. I say just don’t be ashamed to talk to those close to you, maybe your kids’ god parents, their grandparents, close friends. Let them know your kids have a simple wishlist.